Fro-yo & Milkshakes at Yogurtini! Swirl it, Top it, Weight it, at Yogurtini! 10 – 16 Flavours of yoghurt to choose from and a variety of toppings to sweeten your Fro-Yo desires. Check out the milkshakes and other hot beverages while you’re there! 50% off some fro-yo fun! At Yogurtini, they cater to the cool and hip – sophisticates like you :) Here the options are endless. They provide you with 10-16 featured frozen yogurt flavors, continually adding new taste sensations while featuring over 65 toppings. And, since they’re always taking suggestions from their customers, you never know what you’ll find in the shop next. Mix and match any way you like. So go ahead, try a little of everything, or find your own favorite flavor combo! How do you take your Yogurtini? 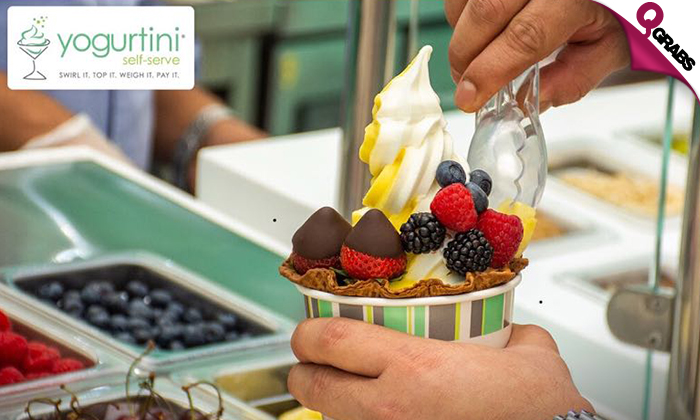 Yogurtini’s premium and top-quality distinctive flavors are developed by some of the most knowledgeable yogurt innovators in the industry. The product is certified to contain live and active cultures to promote good health, plus its creamy texture, original flavors and extensive toppings have been praised by the masses as the best tasting and highest quality frozen yogurt available. The Yogurtini name assures customers that they can expect the same great quality frozen yogurt time after time.